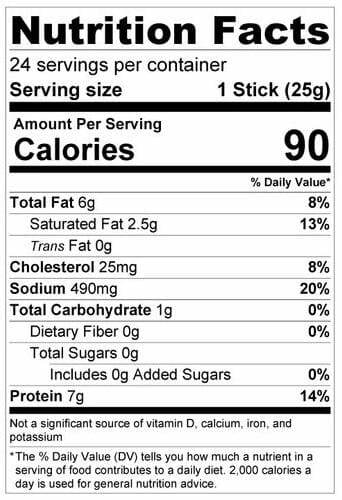 Tomer Kosher Beef Sticks Cajun flavor is AKA Rajun Cajun AKA this flavor will make you crazy it’s so good! A Simple Snack For A Busy Life. Tomer Kosher abide by the philosophy that simpler is better. They grind one piece of beef (the chuck), mix it with seasoning, and bake it in an all-natural beef casing. This makes for a tender, tasty beef stick without an artificial aftertaste. Ingredients: Beef, Water, Seasoning (Salt, Corn Syrup Solids, SPices, Dehydrated Garlic), Sodium Lactate, Modified Carrot Product, Citric Acid, Liquid Smoke, Celery Juice Powder, Stuffed into a Beef Collagen Casing.